Le Salama: Moroccan food with belly dancing show. On the top floor there is a bar selling alcohol (possibly the only one in the area) which has a happy hour (2 for 1) all evening. Visited December 2015. To be honest, we were too late to get a table in the restaurant we wanted for xmas and ended up here without knowing anything about it, except that it was one of the few places in the Medina to sell alcohol. The dining room is a lovely space and the cocktails and wine were very good indeed (if a bit expensive, but this is the same all over Marrakech). We had the pigeon pastilla to share which was excellent, but a bit big for a starter, even to share. Both tagines (lamb and prune, and chicken, honey and almonds) were superb. We got a table in the window alcove, which was nice, but if the other tables are occupied, it turns into a bit of an echo chamber, so you can hear the other couples conversations, which was a bit istracting. Beautifully furnished and all the staff are very professional. 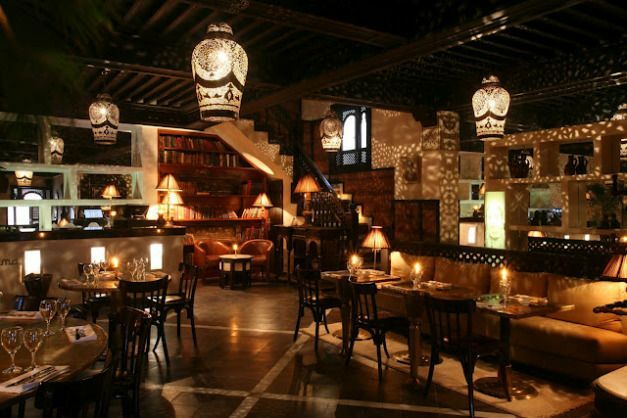 The prices are slightly higher than average in Marrakech but the quality of Le Salama is far superior. Treat yourself.